I recently posted on whether tourists to Rome should use the city's public transport (short version: I think yes). For many, though, being told that Rome's buses and metros are fairly frequent, reliable, and cheap is all well and good, but how the heck do you actually use them? And so: Some top questions — and answers — about Rome's public transportation. Where do you buy a ticket? You can buy your ticket — which combines unlimited bus rides and one metro ride from 75 minutes after validation — at any tobacco shops or metro stations. 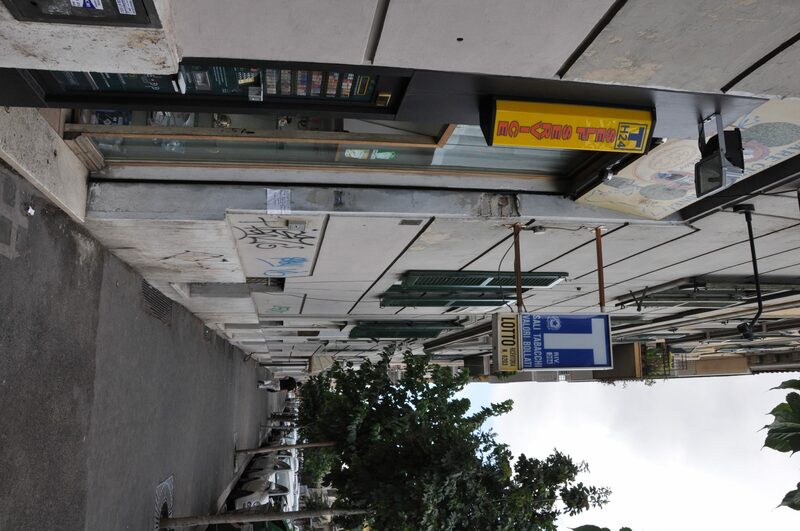 Some bus stops, like the one at Largo Argentina, also have ticket machines. Some buses do on board, as well, but I wouldn't count on it. 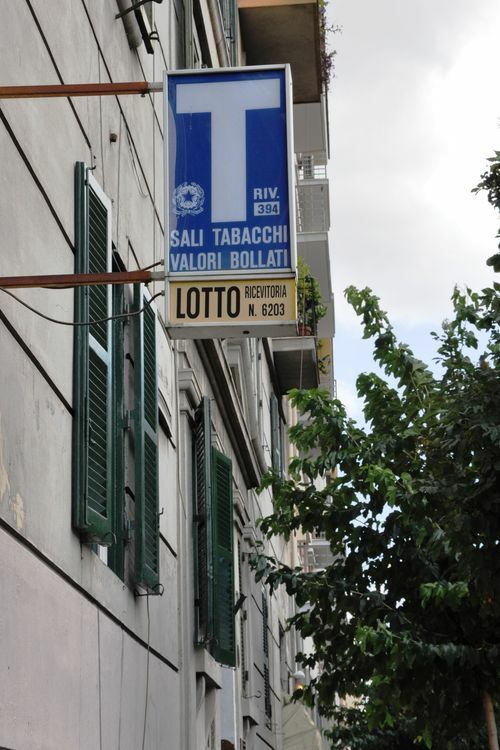 I've posted previously on how to find a tabaccaio and what else you can buy there. Should I get a RomaPass? What are my other options? The RomaPass is easy and convenient: For €25, you get two free site entrances, discounted entrances elsewhere, and unlimited public transport, for three days. But as I've written before, it's not for everyone, even when you consider that it lets you "skip the line" at sites. If you're getting the RomaPass primarily to save on public transport, meanwhile, you're making the wrong choice. You have other (and cheaper) options, all sold by the city at the same locations as the normal €1 tickets. For €4, you can get an unlimited ticket for a day. €11 gets you an unlimited ticket for three days (that's less than half the cost of the RomaPass). And if you're staying for a week, you can spring for the €16 ticket, good for seven days. Why didn't anyone check my bus ticket? Because they don't do it that way here. Instead of checking your ticket when you get on the bus, instead, Rome will (very occasionally) send guards onto buses at random stops to check all the passengers for their tickets. If you don't have a validated ticket, you get a fine. They used to do the metro this way, too, but that system changed a few years ago. I had a ticket and when the bus was checked, I got a fine! Why? First, bad luck! Checks seem to happen very, very rarely — I take the bus once or twice a day, and I've been checked only twice in the past year. The reason why your ticket wasn't sufficient, though, is probably because you didn't validate it. That means running it through the yellow machine on the bus as soon as you get on. (The metro does this for you when you feed your ticket through). The machine stamps your ticket with the time; if it's been 75 minutes since validation or if the ticket was never validated at all, it's, well, invalid. Otherwise, everyone would just carry the same ticket around and use it over and over and over. If someone tries to give me a fine, should I pay it on the spot or wait? If you're unlucky enough to have screwed up the time, failed to validate, or plain old forgotten to buy a ticket — and get checked — you'll probably be given an option by the guard. You can pay €50 in cash on the spot. Or, you can fill out a form to get a fine sent to you at your home address, to the tune of €100. The offer of cash-in-pocket seems a little sketchy. But it's not. It's even written on the sign with ticket prices that you should see when you get on the bus (in Italian). My best guess is that they have the two separate fees because they know that, if they send you a fine at your home address, it will most likely 1) not ever arrive or 2) not ever be paid by you, who's returned back to your foreign home country and will never be forced to deal with said fine…and, most likely, not even be forced to deal with it even if you returned to Italy, even to live. By offering you the cash option instead, at least this way, they know they have the money. Why doesn't the metro run to Piazza Navona, the Pantheon, and other sites that seem like they'd be pretty useful? Rome's working on building metro Line C, which will go closer to some of those sites. In general, though, Rome's lines A and B skirt the centro storico. That's primarily because it's too tough archaeologically: Whether you're walking around Piazza Venezia or the Pantheon, you have an ancient city from 10 to 20 feet beneath your feet. It's pretty hard to build a metro line there, particularly with entrances, without disrupting all of those archaeological treasures. How can you tell at the bus stops what the bus route is? With difficulty! Romans know Rome pretty well — and the bus stops were designed for them, not for tourists. So instead of a handy bus route map at each stop, you get, instead, a somewhat-befuddling list of the names of bus stops. (Shown above). Sometimes, this can work out. Piazza Venezia is a stop that's usually listed as "Venezia" or "Piazza Venezia"; "Aracoeli" takes you there, too. But Piazza Navona is rarely "Piazza Navona" (look for "Rinascimento," instead), and if you get on a bus to "San Pietro", you might wind up pretty darn far from St. Peter's Basilica — instead, the closest stop is the one called "Cavalleggeri." And if you want to get to the Cavour metro stop, don't get on a bus with a stop called "Cavour." That'll take you over near the Vatican. The best way to use the buses, therefore, is to plan a route — and have a bus number in mind — in advance. 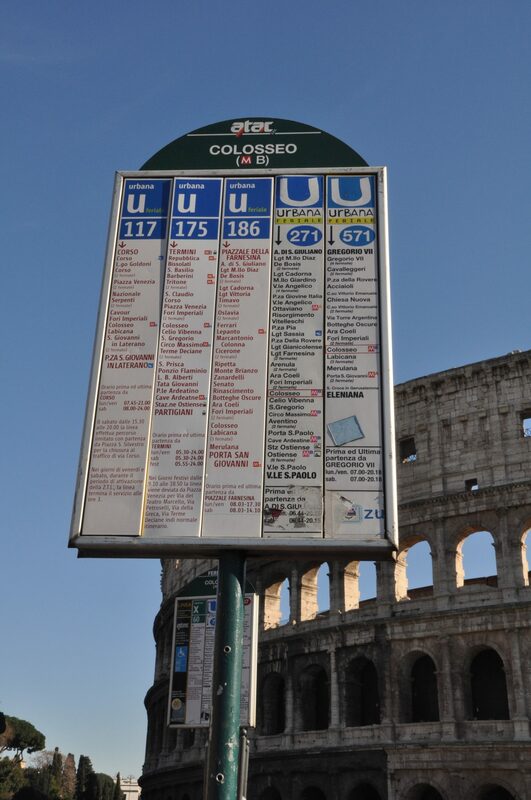 Unless you know Rome fairly well, just wandering around looking for a bus with the stops you want can be an all but impossible way to get around. So how do you plan a route or figure out what bus you want in advance? Ah, here it gets simple: Go to www.atac.roma.it. Put in your starting point (in the "da" box) and destination ("a"). Click "vai," and your route is planned out for you. Bus numbers and all. Few aspects of a city are more necessary — or more potentially infuriating — than public transport. That's as true of Rome as it is anywhere else. 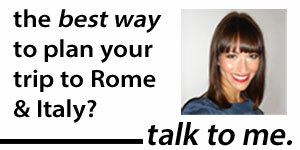 Still, many visitors come to Rome with some big misconceptions about its public transportation systems. The biggest? That Rome's public transport is incredibly confusing, and only for locals, and tourists should stick to taking taxis instead. Or that it's terrible and just so much worse than the systems in other countries. First: It's true that cabs can be an attractive alternative to public transport. They get you exactly where you want to go, they're everywhere (usually), and they're cheaper than taxis in other cities, like London or New York. But. All of those fares add up; spending 8 euros each time you have to get somewhere instead of the 1 euro a bus costs makes a big difference. Secondly, just when you want one, you won't be able to find one; many taxis seem to use taxi stands instead of cruising the streets looking for fares, and if it's rainy or just before dinner-time, it can be tough to flag one down. Finally, you have to be pretty careful when taking taxis. While it's getting better, some drivers won't hesitate to try to rip off a tourist, either by taking a circuitous route, not turning on the meter, or running the meter on the wrong rate. (Stay tuned for a future post on taking taxis in Rome). That's where public transport comes in. 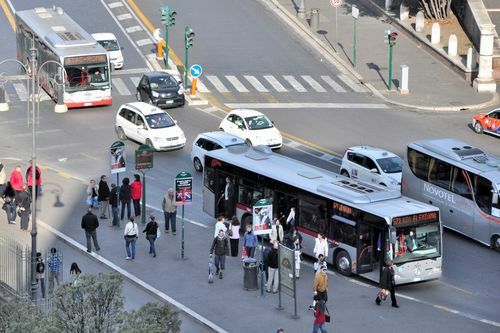 Many visitors shy away from Rome's buses and metros, seeming to think the system is terrible. It's not perfect, but it's certainly better than that of many other cities I've traveled in. Overall, Rome's buses and subways are clean, cheap (one euro per ride), frequent, and relatively reliable. The metro system, especially, is remarkably good. I've never waited longer than 5 minutes for the next train. (I can't say the same for most other cities I've been in, from D.C. to New York). And a handy little display tells you how many minutes away the next metro is, like London's Tube. The problem with the metro, though, is that it doesn't cut through most of the centro storico. (Line C, currently being dug, should fix some of that, but don't plan on using it unless your next trip to Italy is sometime after 2015). So the metro is great for getting from, say, the Spanish Steps to the Vatican, but not for getting to Piazza Navona, the Pantheon, or myriad other sites in the center. That's where the buses come in. And while I complain about them all the time, I have to admit: The buses, too, are fairly reliable. They also go all over the place, even down those narrow, winding streets that you wouldn't expect even smart cars to venture down, never mind city buses. But if you opt to take the bus, remember that some come far more often than others. And one bus that usually comes every 10 minutes might, when you try to get it, take 25 minutes to arrive. (Sod's Law tends to apply even more in Rome than other cities). Only some of the stops tell you when the next bus is arriving, and even that information can be wrong. Still. I like the bus because it goes more places, and you can look around at Rome's beautiful buildings while you're riding. So: If you're coming to Rome, plan to walk. Plan to take a cab, maybe. But also do yourself a favor — and do as the locals do — and take Rome's bus or metro. Coming soon Also see: why didn't the driver check my ticket, how come the bus stops don't show routes, and other tips for using Rome's bus and metro systems.